I am one of the founders of the online backup company Backblaze. (Read a personal description of Backblaze here.) Our spokes model is Cara Panebianco, she announces our products and is the "face of Backblaze". 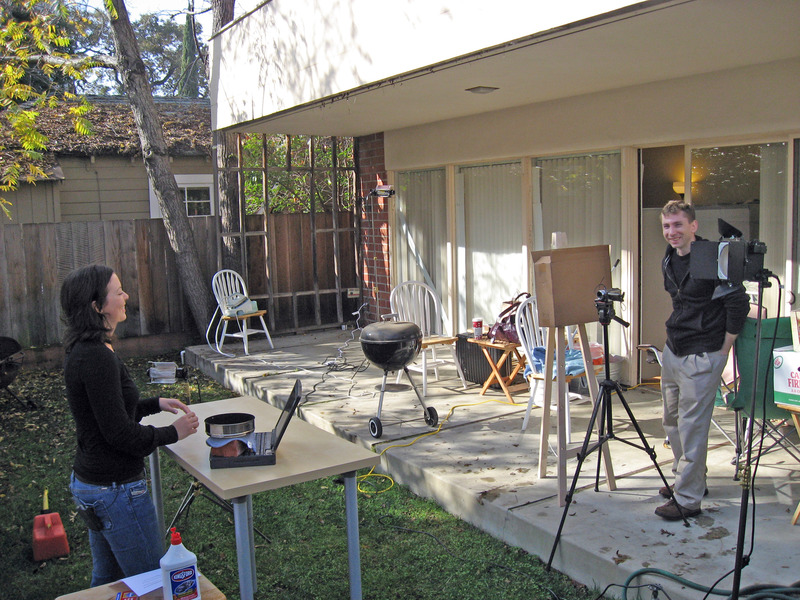 On this day (12/3/08) we shot a video to announce the Macintosh version of Backblaze. This is a little behind the scenes look at the video shoot. Casey Jones is our VP of Design and so he directs and shoots the videos. At Backblaze, we are experts in encryption, networking, and file integrity. On the other hand, we are not video production experts. :-) We like the videos on our website, and we do these videos for fun and interest and marketing reasons, and therefore we don't want to spend a huge amount of money on them. We shoot all the videos ourselves using reasonably good equipment, but we don't rent a sound stage or hire professional camera or sound men. Below is the description of how we create these videos without spending a lot of money and in a reasonable amount of time. We use a Canon VIXIA HF100 1080p High Definition video camera on a tripod to shoot the Cara videos. The camera has a plug for an external microphone, and we use a wireless microphone for Cara (a Sennheiser EW 100). We use iMovie on the Mac to edit the videos, and we publish them in Adobe Flash to our website. 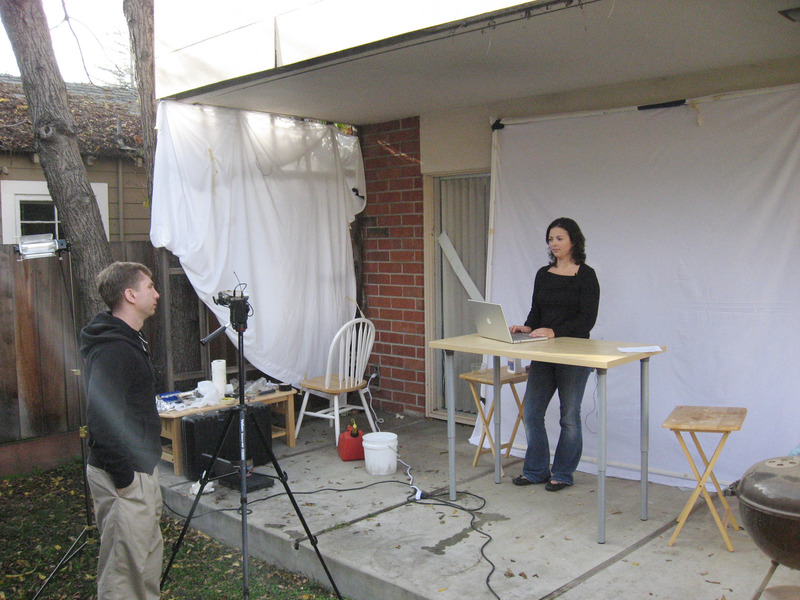 The flash video is embedded in a white web page with other things going on, so we shoot the videos against a "white screen". Our white screen is a white bed sheet duct taped to a square of PVC pipe we can disassemble and store. Below you see Casey and Cara setting up the shot in the Backblaze court yard. We shoot outside because we're burning things, lighting things on fire, and also we like the natural light outside more than fluorescent for how it makes the videos look. On the other hand, DIRECT sunlight causes glare and throws shadows, so we move the video "set" around (the white screen) to keep it out of any any direct sunlight. Same picture as above, different perspective. There is a professional level halogen light to Cara's left (far right corner), but we set up an ad-hoc box on an easel to block the sun from glinting on the camera lens. The only real "professional equipment" that is really important is the video and audio gear, all the lights and shades and everything else is just a commodity that spending lots of money on won't make the video better. Here is an explanation of the laptop in front of Cara: it contains a pan with about a shot glass full of unleaded gasoline. The pan is hidden from the camera. Cara first PRETENDS to spray the laptop down with barbeque lighter fluid (it is really just water), then flicks a match into the pan with gasoline causing flames to shoot up. While this seems kind of silly (and you can see Cara and Casey laughing below), the effect is quite good and shocking for a web video. Below is a 20 second Youtube video of how the Backblaze video is shot from a "behind the scenes" perspective. For WINDOWS ONLY click here for a much higher quality version. A few hours later we rotated the set to a different location to get away from the sun again. Cara now has a Macintosh in front of her for the "Mac Launch" announcement video. 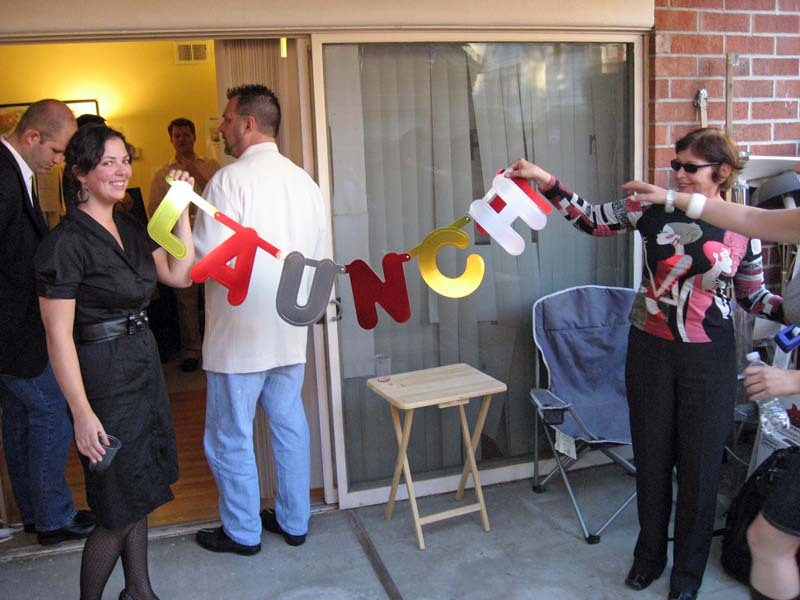 We quickly hung another white sheet to the left to prevent some bright sunlight from throwing shadows, and it worked quite well. Casey Jones behind the camera, super model Cara Panebianco on the set. Notice the wireless microphone pickup hanging off the right side of the camera, and you can see the wireless microphone wire hanging off of Cara's back pocket.